Writing is one of the most important means of communication - the only one that can defy time and space. Whenever there has been civilization there has been writing and reading in the remote past as in the present day. Written language has become the vehicle of civilization and so of learning and education. Writing is thus one of the main aspects of culture which clearly distinguish mankind from the animal world. The purpose of this book is to provide an introduction to this fascinating subject of the history of writing or the alphabet. In the first part a historical sketch of the development of the non-alphabetic scripts is discussed and the second part deals with the origin and development of alphabet. More space is devoted to less-known problems, to those which present more interest from the standpoint of the history of writing, to the origins of some single scripts, to the connection between the various system, and so forth rather than deal with all the alphabets of all the modern nations of the world. The book is intended for two different type of readers. The general readers will, it is hoped, welcome the information supplied by the notes on the history of some little known people and on the linguistic and ethnic problems presented by others. The student on the other hand, who may use the book as an approach the study of different scripts and alphabets, will undoubtedly find the bibliographies a valuable aid to further study. It is true that one or two recent writers have cried down writing as the instrument by which cliques of priests and rulers enslaved the far more useful handworkers. But without writing these authors could not have brought this injustice to our attention, and it is no doubt by writing that they will set it straight. Be this as it may, the history of writing makes an attractive story; I have felt the attraction ever since as a schoolboy I read Isaac Taylor's Alphabet, and for more than twenty years I have yearly lectured on the subject. It is difficult to exaggerate how much it has grown since his time, many new scripts have been discovered, to several of them the key had to be found, to a few it is still missing. Some ten years ago Dr. Diringer's great Italian work L'Alfabeto nella Storia della Civiltd, for me superseded all former sources. Now I welcome the same store of learning duly increased and recast in an English form. The whole matter has a special interest as affording the best opportunity for studying the phenomena of diffusion and of independent invention and of the mixed process which has been called "idea diffusion," the stimulus to invention afforded by the knowledge that a problem has been solved, though its particular solution may not be known, or may not be acceptable. By its very nature writing keeps a record of its own development. Our author proves with a new completeness the astonishing fact that almost certainly every alphabetic writing of any importance derives from one source, and the obscure scripts were devised by men who were aware of the existence of perfected alphabets. This is a fascinating result; it is so rare in life that so sweeping a generalization is tenable. Though he calls his book The Alphabet, our author deals frst with non-alphabetic writings, the great systems of Egypt, Mesopotamia China and Central America, and the various ideographic odds and ends. These are all separate inventions, great inventions no doubt, but not so great as to be unique. It is very interesting to note how close to each other were the mental processes by which the three great systems were built up. Then he clears the syllabaries out of the way, poor half and half things derived from more complicated scripts without reaching true simplicity. Finally he attacks the thorny problem of the real alphabet. He bids us give up our hope that the key is in the Sinaitic script, but will not say more than that alphabet-making was in the air in Syria during the first half of the second millennium B.C. We must commend his self- restraint in not leading us beyond the edge of solid ground. 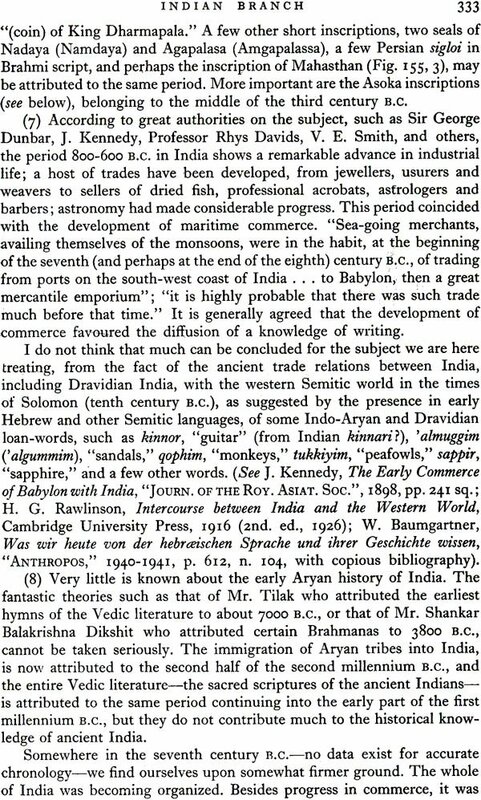 The writings of Asia, either ideographic or alphabetic, amount to about a hundred, another hundred fills the Indian world and Its derivatives. No one has explored this last labyrinth as deeply as our author-I am not sure that many would wish to do so. The climax is the story of the Greek alphabet and its descendants, some fifty scripts, the part of the tale which comes nearest to us. But it has its surprises, we have to accept that our Latin alphabet would not be what it is if it had been derived directly from western Greek: to those like me who dislike the Etruscans, it is a grief that we should have got our alphabet through them; for myself I think it would have been better without their share in it. To the Etruscans also, through small neighbouring peoples, it seems that we northern Teutons owed our runic writing: for many years scholars derived it alternately from Greek and from Latin-now the strife is over and we can happily credit the Raetians or some such tribe with teaching our ancestors to write. Here is the story duly enlightened by a great series of illustrations. We owe much to the publishers for their liberality in this respect. Taylor had to manage with some hundred pictures, they have allowed us generous measure, nearly one thousand illustrations grouped in over two hundred and fifty "figures." These enable us to follow the fascinating story in all its ramifications as set out so clearly and diligently by our author. At last we have in English a worthy successor to Isaac Taylor. THE purpose of this book is to provide an introduction to the fascinating subject of the history of the alphabet. In the First Part I shall try to give a historical sketch of the development of the non-alphabetic scripts, although the present book will deal more particularly with the origins and development of the alphabet, to which the Second Part is dedicated. The main problems of the primitive means of communicating ideas, of the origins and the beginnings of writing, together with a more detailed study of the non-alphabetic scripts and the development of handwriting, must be left to my next book on writing as a whole. Even so, a book on the development of the alphabet of the narrow dimensions dictated by publishing difficulties can achieve its goal only if the reader is prepared to accept various limitations. For instance, he must not expect to find a complete bibliography: had this been attempted, the space available would have been filled with nothing but the names of authors and titles of books. Those who wish to pursue the study further are referred to the bibliographical works cited in my book L' Alfabeto nella Storia della Civilta, Florence, Barbera, 1937. Specific references have generally been omitted for the sake of brevity and clearness and in the interest of the general reader; but it must not be supposed that the debt of this book to previous scholars is ignored. It is not possible to deal in detail with all the alphabets of all the modern nations of the world. I shall, instead, devote more space to less-known problems, to those which present more interest from the standpoint of the history of writing, to the origins of some single scripts, to the connection between the various systems, and so forth. Some chapters may, in consequence, seem disproportionate in comparison with others, since unanimity cannot be achieved on matters of treatment; questions which seem most important to one person, may appear unimportant to others. I shall do my best to simplify as far as possible the more intricate problems by presenting my conclusions and by indicating whenever practicable the basic proofs out of which my conclusions grew. If the general reader will exercise the necessary patience, he will be able to survey the main documentary evidence revealing the development of writing, particularly of the alphabetic scripts used in the past or in the present day. At the same time, the general sketch of the subject, the facts presented and much of the interpretation put upon them will, I hope, appeal to students of writing whose presuppositions differ from mine, and to all scholars who are specialists in the individual fields here examined, but not in the subject as a whole. For obvious reasons, no attempt has been made to give an exhaustive account of all the pertinent material, and documentation has been restricted to a minimum. Doubtful material has been eliminated as far as possible, and nothing has been included which is not strictly verifiable from different sources. Speculation has been omitted except in some special cases. On the whole, I have attempted to treat the history of writing on the same lines as other types of history, but those sections in which too little is known, are presented as a series of unembellished facts. In some instances, in view of the dearth of original documentary sources, I have not felt disposed to indulge in speculation. A work of this kind cannot possibly be carried out without troubling many people, and I am therefore glad to acknowledge my gratitude to all those who have helped and supported me. Dr. L. Barnett, Mr. R. D. Barnett, Dr. E. Cerulli, Miss H. Herne, Mr. G. F. Hudson, Miss Evelyn Jamison, Mr. A. Master, Dr. M. A. Murray, Mrs. Hilda Splitter, Mrs. Beauchamp Tufnell, Miss Olga Tufnell and Mrs. K. P. K. Whitaker (Miss Lai Po Kan) have read parts of my text in typescript and have made valuable criticisms and suggestions in detail. To all these scholars 1 am greatly indebted. Furthermore, I tender my sincere gratitude to Sir Ellis H. Minns for his interest and help, not only in reading the proofs of the book at an early stage, but also for contributing much of his vast knowledge and experience. My thanks must also be expressed to the Society for the Protection of Science and Learning, to the Wellcome-Marston Archaeological Research Expedition to the Near East, to the Institute of Archaeology, University of London, and to the London School of Oriental and African Studies, who have helped me in one way or another. It is my pleasant duty to express my deep gratitude to the Scientific and Technical Department of Hutchinson and Company, and especially to Mr. W. H. Johnson for his unremitting care and attention to the host of technical problems which have arisen in the production of this book. Finally, in view of the special technical difficulties involved, due acknowledgment must be made of the skill and care of the printers, whose interest went beyond their usual function, and the result of their expert and patient counsel appears on every page. As far as possible I have omitted the diacritical marks which have been devised by modern philologists for use in transcribing various alphabets into Roman script. These marks, which serve to indicate the precise value and pronunciation of certain symbols, consist of points, dashes, circumflex accents, and so forth, added for instance to the letters g, h, s, t, etc., and so forming the special signs, g, h, s, s, s, t, and many others. These diacritical marks are indispensable in learned and technical works, but they would only confuse the general reader more especially since the phonetic values represented by them are not constant; for instance the value of the Semitic s is quite different from that of the Indian s; and the same is true of other letters and sounds in various languages. In the spelling and transliteration of Egyptian, Semitic, Indian, Chinese, Greek and other words, especially place-names and proper names, the practice commonly adopted has in general been followed, but here and there consistency has been abandoned in order to present to the reader familiar names in their familiar forms. Some spellings are, for purposes of economy, simplified in cases where no confusion will result. On the whole, inconsistencies in a composite work like this are unavoid- able, and the general reader should understand that a quite satisfactory solution of the problem of transliteration has not been found. Indeed, I have to admit that after trying hard at an early stage to arrive at some consistency, I had to abandon the attempt as hopeless, and welter in the prevailing chaos; in some cases divergent transliterations still cause difficulties, but it is reasonable to assume that general readers are indiffer- ent to what experts know, while experts do not always agree as to the precise spelling. Besides, some scientific transliterations are as formidable-looking as Chinese or hieroglyphs. On the whole, the consonants are transliterated according to the English sounds, while for the vowels I use the system, generally adopted, of transliteration according to the Italian phonetic values, corresponding roughly to the following sounds: a as in "father," e as in "bell," i as in "field," a as in "order," u as in "rude"; the letter y is employed with the same phonetic value as in English. who may use the book as an approach to the study of individual scripts and alphabets, will undoubtedly find in the bibliographies a valuable aid to further study. Of these, the general bibliography will be found at the end of the volume, and the bibliographies dealing with particular subjects at the end of the relevant chapters or of the paragraphs in which the script in question is discussed. How many people try to realize what writing has meant to mankind? How could there be accumulation of wisdom without its being recorded in written characters? If culture is, as many scholars think, "a com- municable intelligence," and if writing is, as it is, one of the most important means of communication-the only one indeed which can defy time and space-it is not an exaggeration to say that writing is the main currency of man's civilization. Wherever there has been civilization there have been writing and reading, in the remote past as in the present day. Written language has become the vehicle of civilization, and so of learning and education. Writing is thus one of the main aspects of culture which clearly distinguish mankind from the animal world. The first and perhaps the most obvious consideration is that the introduction of the art of writing gives permanence to man's knowledge. Without letters, there can be no knowledge of much importance. The evidences for studying the earlier ethical development of ancient civilization are very scanty, and always indirect, until we reach the introduction of writing and the production of written sources. The study of the history of writing should, therefore, be considered as one of the more important, perhaps the most important, of the departments of historical science, and as a clue to the story of human intellectual progress. No wonder that in the past writing was held in much esteem. The ancient Egyptians attributed the creation of writing either to Thoth, the god who invented nearly all the cultural elements, or to Isis. The Babylonian god of writing, Nebo, Marduk's son, was also the god of man's destiny. An ancient Jewish tradition considered Moses as the inventor of the script. Greek myths attributed writing to Hermes or to other gods. The ancient Chinese, Indians and many other peoples also believed in the divine origin of the script. Writing had always an enormous importance in learning and a magic power over the unlearned people, in such a way that even to-day "illiterate" is almost synonymous with "ignorant." Nowadays, however, astonishing as it may sound, the history of writing is the true Cinderella with learned men and the layman alike. No such subject is taught either in the Universities or in the secondary or primary schools; no important museum has thought it necessary to offer to the public a comprehensive exhibition of the story of writing. Although thousands of articles on matters forming part of our subjects have appeared in hundreds of anthropological, archseological, philological and other learned periodicals, published in every civilized country of all the five continents, and in the transactions of various learned societies, learned books dealing with this subject as a whole are very few and mainly out of date or incomplete. In particular, no serious attempts have been made to collect and present within reasonable compass for popular consumption the vast amount of matter relating to the history of writing. The author does not claim to have done this, and he hopes that this book will not be considered as an exhibition of that type of scholarship which wishes to be regarded as omniscient and encyclopaedic. There cannot, obviously, be much originality in a book of this kind unless it is in the way in which things which belong together are brought together and their relationships and outside influences are classified; it is an effort to put the whole matter, as far as possible, in its true light. Indeed, the limited number of books dealing with the whole subject in contrast to the infinite number of articles treating of some detailed question within it, scattered over an infinite number of journals, can be explained, partly at least, by the difficulties involved in the investigation of this enormous field of human knowledge, the history of writing. As a matter of fact, the subject demands a new type of historian, a historian who is alike anthropologist, ethnologist, psychologist, philologist, classical scholar, archaeologist, palaeographer, orientalist, egyptologist, americanologist, etc. Although, as already mentioned, the history of writing does not constitute a subject of teaching in a University or any other school, it forms the main basis for two important branches of study: (I) Epigraphy (with its sub-divisions, such as Greek epigraphy, Latin epigraphy, Hebrew epigraphy, and so forth), that is the science which deals mainly with ancient inscriptions, including their study, decipherment and interpretation, i.e., the records cut, engraved, or moulded on hard material, such as stone, metal or clay. (2) Palaeography (with parallel subdivisions, that is Greek palaeo- graphy, Latin palaeography, Hebrew palaeography, etc. ), which treats mainly of the writing-including study, decipherment and interpretation of the texts-that is painted or traced with ink or colour, with a stylus, brush, reed or pen, on soft materials, such as paper, parchment, papyrus, linen or wax. The study of palaeography is of the greatest practical importance to textual criticism, to classical philology, to ancient and medizeval history, and to other branches of historical science, whereas the study of epigraphy has revolutionized our whole knowledge of the ancient world. Thanks to epigraphy, the last century has witnessed the rediscovery and reconstruction of entire civilizations, each of them beginning in a high antiquity, and each presenting a highly organized society. Certain branches of the history of writing form part of other depart- ments of learning; for instance, hieroglyphic, hieratic and demotic writing are comprehended in egyptology, cuneiform writing in assyriology; the writing of primitive peoples is dealt with by anthropologists or ethnologists, Chinese writing by sinologists, the Arabic scripts by arabists; the development of Indian writing forms part of Indian epigraphy and palreography. Philologists and glottologists-students of the science of languages-deal also with the development of writing in connection with the language or languages with which they are concerned. On the other hand, graphology, "the science of writing," is more concerned with the psychological and biological points of view than with the history of writing. The cultured man is also sometimes interested in one or another branch of the history of writing. Egyptology and assyriology, including the study of hieroglyphic, hieratic, demotic and cuneiform writings, had their "good times" in certain periods of the last century; hittitology, that ic the branch of learning concerned with the Hittites (the ancient inhabitants of Asia Minor and northern Syria) and their scripts, was in great consideration at the end of the last century and in the first decades of the present; alphabetology, the new department which deals with the intricate problems of the origin of the alphabet, had a brief enjoyment of "good time" quite recently in the U.S.A.
Study of history of writing. Writing and early civilization. Various stages of writing: embry-writing; iconography and "sympathetic magic" -rock picture; mnemonic devices; symbolic means of communication; pictography or picture-writing; ideographic writing; transitional scripts; phonetic writing: syllabries or syllabic writing; the alphabet. The name. Beginnings. Development of system. The peoples who employed cuneiform writing: Sumerians; Babylonians and Assyrians; other peoples Elamites; Early Elamite script; Neo-Elamite writing. End of the cuneiform writing. Decipherment. Bibliography. The name. Origins. History of hieroglyphic writing. Hieratic writing. Demotic writing. Decipherment of Egyptian scripts. Bibliography. Minoan civilization. Undeciphered scripts of Crete: Pictographic scripts ; Linear scripts. Origin of Cretan scripts. Attempted decipherments. The Phaistos disc. Bibliography. General sketch. Exploration, excavation and studies. Cultural and chronological relationships with other civilizations. The Indus Valley script. Origin. Attempted decipherments. Supposed influences on other scripts. Bibliography. Hittites. The peoples: their language and civilization. Main historical events. Hittite hieroglyphic writing. Origin of Hittite hieroglyphic writing. Bibliography. General sketch. "Mystery" of ancient Mexico. Study of ancient Mexico and Central America. Cultures of ancient Mexico and Central America. Main peoples who developed ancient Mexican and Central American cultures: Mayas; Zapotecs; Toltecs; Aztecs. Indigenous scripts of pre-Columbian America: Aztec character; Aztec codices, Aztec script. Maya script; Maya system of writing. Bibliography. "Mysterious" problem. Facts. The script. Origin. Connection with other scripts. Bibliography. General sketch. "Ideographic" scripts of non-Chinese people of China: Lo-lo-Mo-so group;Lo-lo script; Mo-so scripts; Man group: Central and northern China; Tangut script; bibliography. West African "ideographic" scripts; Nsibidi; the name; origin; the script; bibliography. Bamun scripts; bibliography. Recent ideographic scripts of American Indians; bibliography. Minahassa script. Chukcha script; bibliography. Syllabaries. Pseudo-hieroglyphic script of Byblos: the inscription; the script; decipherment. Cypriote syllabary; bibliography. Japanese scripts: prehistoric Japanese "writings"; origin of Japanese scripts; Japanese ideograms; Japanese syllabic scripts; bibliography; suggested introduction of Latin alphabet. Cherokee syllabary: the script; origin. Morice's and Eubanks' Cherokee scripts; bibliography. Vai syllabary: bibliography. Artificial scripts of native Canadian tribes: Cree syllabary; bibliography. Southwestern China: the pollard and allied systems. The scripts. Early Persian cuneiform script: the script; origin and end; inscriptions; decipherment; bibliography. Meroitic scripts: Meroe; the scripts; orgin; influences; bibliography. The problem. Egyptian theory. Other theories. Cretan theory. Prehistoric-geometric signs theory. Ideographic theory. Sinaitic theory. Ugarit cuneiform alphabet. The pseudo-hieroglyphic script of Byblos and the origin of the alphabet according to M. Dunand. Undeciphered inscription found in Egypt. Balu 'a inscription. Other attempts at alphabetic writing. Early Canaanite inscriptions and "missing-link" theory. North Semitic inscriptions. Original alphabetic writing. Where was the alphabet invented? Influence of other systems. Decisive achievement. Absence of vowels. Names of letters. Order of letters. Main branches of early alphabets. Bibliography. Ancient South Arabia. South Semitic alphabets. South Arabian inscriptions. North Arabian inscriptions. Origin of South Semitic alphabets. Ethiopic script: origin; development of Ethiopic writing. Bibliography. Cannanites. Early Hebrew alphabet; inscription; the script. Samaritan alphabet and script on Jewish coins. Scripts of Moabites, Ammonites, and Edomites. Phoenician laphabet. Bibliography. Probable offshoots of Phoenician alphabet: Libyan scripts; bibliography. Iberian scripts; bibliography. Th Aramaeans; Aramaean states; spread of Aramaic speech. Aramaic alphabet; development; "dog-Aramaic"; Armazi Aramaic. Offshoots of Aramaic alphabet; classical Hebrew alphabet: origin; inscriptions and manuscripts; varieties of Hebrew alphabet; modern Hebrew alphabet; vowel marks; other diacritical marks; origin of punctuation marks and their employment; Yiddish and Judezmo. The Nabataeans and their script. Neo-Sinaitic alphabet. Arabic alphabet: Arabic language and script; origin of Arabic alphabet; early development of Arabic alphabet; development of Arabic script: Kufic and Naskhi; modern Arabic alphabet; diacritical points; adaptation of the Arabic character to other languages. Palmyrene alphabet. Syriac scripts: character to other language. Palmyrene alphabet. Syriac scripts: Syrians; their scripts; syriac; Christian Palestinian or Palestinian Syriac; Syriac alphabet; vocalization; punctuation; direction of writing; varieties of Syriac scripts: Estrangela and its descendants; "alphabet follows religion": Nestorians; "Assyrians"; Jacobites; Melkites; development of Nestorian, Jacobite and Melkite scripts; Neo-Syrian character; Garshuni; Greek in Syriac script. Mandaean alphabet. Manichaean alphabet. Bibliography. APPENDIX TO CHAPTER IV. (Section on Arabic alphabet). Malagasy script - problems awaiting solution. Yezidi cryptic script. Balti alphabet. Somali alphabet. "The alphabet follows religion." Kharoshthi scrip and the problem of Indian writings; coins and inscriptions; other documents; the script; bibliography. Persian or Iranian scripts: general sketch; Pahlavi; Aramaic "ideograms"; Pahlavi alphabets; the scripts; the Avesta; bibliography. Sogdian alphabet; bibliography. Kok Turki runes; bibliography. Early Hungarian script; bibliography. Uighur alphabet; Buriat alphabet; bibliography. Probable offshoots of Aramaic branch; Armenian scripts; Armenian alphabet; origin of Armenian writing; bibliography. Georgian alphabets: Georgian; Georgian scripts; origin; bibliography.Alban or Alvan alphabet. Origin of Indian writing: theories concerning origin of brahmi script. Indian inscriptions. Development of Indian scripts: Early period (up to fourth century A.D.); main type of early Indian or Brahmi scripts: (1) script written from right to left; (2) Early Maurya type, third century B.C. 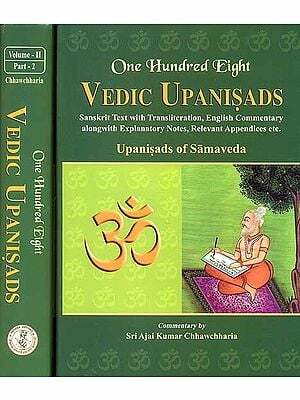 ; (3) Early Kalinga type - the "Dravidi script; (4) Early western Deccan or Andhra script; (5) Late Maurya type; (6) Sunga type; (7) Prototypes of North Indian sub-division; (8) Prototype of South Indian scripts. 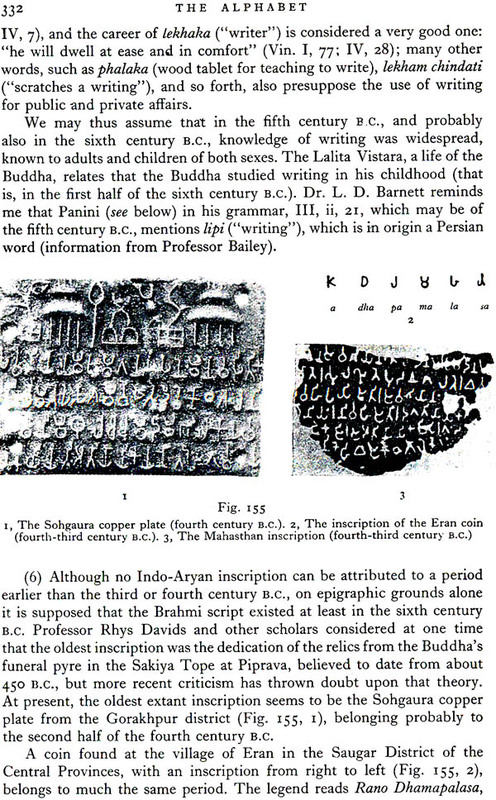 Further development of Indian scripts: North Indian scripts (fourth century A.D. -fourteenth century): North Indian monumental type known as Gupta; Central Asian Gupta sub varieties: Central Asian slanting Gupta: Agnean and Kuchean; Agnean and Kuchean charactyers; bibliography; Chinese in cursive Gupta character. 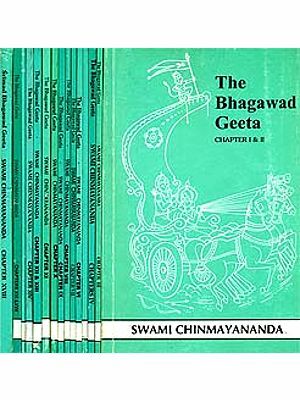 Western branch of eastern gupta; bibliography. Tibetan scripts and their offshoots: Passepa Character; Lepcha character. Adaptation of the Tibetan character to other language; the Nam language; Chinese in Tibetan writing. Siddhamatrka character; Deva-nagari script; Nandi-nagari; deva-nagari character; Sarada script; Proto-Bengali character; Oriya script; Maithili character; Early Manipuri character; Assamese character; Kaithi character; Gujarati script; Bihari character; eastern Hindi character; Mahajani character; Modi character. Modern north-western script; Takri character and its varieties: Dogri character; Cameali character; Mandeali character; Sirmauri character; Jaunsari character ;Kochi character; Kului character; Kashtawari character. Landa scripts: Multani character; Sindhi Varieties; Subdgu cgaracterl Gurmukhi script. South Indian scripts: Dravidian languages; development of South Indian character: Western variety; Centeral Indian script; Kanarese and Telugu character ;Later Kalinga script; Grantha character: early Grantha; middle Grantha; transitional Grantha modern Grantha; Tulu-Malayalam character. Tamil character. Vatteluttu character. Sinhalese character: Island of Cylon; development of Sinhalese language and script: Pali-Prakrit Sinhalese; proto-Sinhalese; mediaeval sinhalese; modern Sinhalese; bibliography. Maldivian scripts: General sketc; Evela Akuru; Dives Akuru; Gabuli Tana. Syro-Malabarese alphabet; bibliography. Textof specimens of modern Indian scripts. Bibliography. General sketch. Indo-China ; bibliography. French Indo-China: the Chams; the Khmers; development of Cham-Khmer characters; Chakma character. Burma:the Mons ; the Pyu; the Burmans; bibliography; the Karens; Taungthu and Yao. Siam: the Shans; Lao character; Lu and Hkun characters; Ahom character; Siamese character: origin; development; modern Siamese alphabet; bibliography; Siamese character adatpted to Miao; scripts of "British Shans"; Khamti character; Aitonia character; Thai Mao or Thai Khe'; Chan Lao of Tongking; "Chinese Shans." Indonesia: Borneo; Malaya; ancient Java: old Javanese or Kavi Cnaracter; origin; Kavi inscriptions; modern Javanese character; Sumatra: Sumatran native character: Batak; Lampong and Redjang characters; Celebes: Celebes scripts; origin; Buginese character; conclusion. Bibliography. Philippine Islands: general sketch; ancient characters; Tagalog character; Tagbanua and Mangyan characters; varieties of scripts; vowel-signs; punctuation; peculiar postal service; direction of writing; origin of Philippine scripts. Korean character: Un-mun; vowel and consonants; is the Korean alphabet perfect? Origin of Korean alphabet. Woleai syllabary (? ): the island; native script; origin; bibliography. The Greek. Origin of the Greek alphabet. Changes introduced in the Greek alphabet. Varieties of Early Greek alphabet. Greek vowels. Greek sibilants. Additional consonantal signs. Classical Greek alphabet. Development of greek writing. Greek inscription and manuscripts. Conclusion. Bibliography. Asianic alphabet: Lycian alphabet; Phrygian alphabet; Pamphylian alphabet; Lydian alphabet; Carian script; conclusion; bibliography. Coptic alphabet; bibliography. Nubian character; bibliography. Messapian alphabet; bibliography. Gothic alphabet; bibliography. Early Slavonic alphabets: Cyrillie alphabet; adoption of the Cyrillic alphabet for, and its adaptation to, other language; reform of Russian orthography; Bukvitsa; Glagolitic alphabet; origin of Cyrillic and Glagolitic alphabets; bibliography. Local Albanian alphabets; bibliography. Alphabets of western Europe. The Etruscans. Etruscan inscriptions. Etruscan alphabet. Origin of Etruscan alphabet. Development of Etruscan scritp. Last stage of Etruscan alphabet. Offshoots of the Etruscan alphabet: alphabet of the Piceni; Ventic alphabet; North Etruscan alphabets; Italic scripts: Oscan alphabet; Umbrian alphabet; Siculan alphabet; Latinian alphabets: Faliscan alphabet. Bibliography. Runes: the name; inscriptions and written documents; runic manuscripts; inscriptions found in sweden; Denmark and Schleswig; Norway; the British Isles; other countries; earliest inscriptions; origin of runes; the Futhark; development of runic writing: Early or Common Teutonic of Primitive Norse; Slavic runes; Anglo-Saxon or Anglian runes; Nordic or Scandinavian varieties; Haelsinge runes; the Manx runes; the dotted runes; cryptic varieties; end of runic scripts; bibliography. Oghams: the name; oghamic inscriptions; origin of the oghams; oghamic scripts; bibliography. Pictish oghams; the Picts; the script; heraldry (? ); bibliography: Teutonic oghams(? ); bibliography. Early Latin inscriptions. Origin of the Latin alphabet. Development of the Latin alphabet. Latin cursive scripts. Varieties of the Latin alphabet. Mediaevel Varieties of the Latin alphabet: Italian semi-cursive minuscule; other continental hands; Insular or Anglo-Irish hands: Irish hand; Anglo-Saxon hand. Caroline or Carolingian hand. "Black letter" or Gothic. "Italic" and "Roman" type. Adaptation of the Latin alphabet to other languages. English alphabet. Problem of a standard international alphabet. Bibliography. Specimens of adaptations of Latin script to African languages: Nyanja; Twi; Yoruba; Efik. Oberi Okaime Script. Adaptation of alphabetic scripts to other languages; adaptation of scripts to Turki dialects. Other unknown scripts. External development of letters. Numerals - abbreviations - stenography. Oberi Okaime and Nsibidi scipts are both of Ibibio origins. The Ibibio word "Nyibi" which means turn in English, is the root of Nyibidi. Nyibidi means turning. The play was usually accompanied with drummings. The drum is called Ibit in Ibibio. The drum for the ruling Crown is called Ibit Itam. Itam means crown, hat, or headgear. Ekpe(leopard) was indeed the governing deity and Ibit Itam was one of their major plays. Ukara means governance or government in Ibibio. Ukara cloth is worn by those in the government of Ekpe. The Ekpe and even Ekpo masquerade of old used to dance in a circular motion in order to induce a trance-like effect or feeling. Hence Nyibidi. Ibibio is the largest language of the Cross River and Akwa Ibom territories. Efik, Ekoi, Annang, Oron, Eket, Qua, Ibeno, Okobo,etc. are all variations of Ibibio. The Ibibio owned and controlled Arochukwu until they lost it in 1634 to the allied forces of the migrating Igbo and the Akpa. The Igbo slaves of the Ibibio rebelled and joined forces with the Akpa who were themselves of Ibibio origin. The Ibibios left both Arochukwu and their ancient Long Juju, but those who remained continued to run the oracles and influence the Igbo converts/practitioners of Ekpe. The Ibibios and Efiks taught Nsibidi to the Igbos through the Ekpe society. The chief language used in Ekpe is Ibibio. The Ibibios and Efiks knew Arochukwu as Ibom and Mbot Abasi. Mbot means creation. Abasi means God. Therefore, Mbot Abasi means the creation of God or, simply, the people of God. While in Arochukwu, the Ibibio leaders had a secret society called Ekpe. Ekpe means leopard or lion. The leadership operated (and still does)in an esoteric manner. Only members are privy to the innerworkings of the group. They developed an elaborate system of logograms through which their ideas, knowledge, and activities were recorded. Nyibidi which means turning (going in circles), evolved into Nsibidi. Nsibidi is Ibibio for what is at play or, what's playing? Nso = what. I(as in letter "e" = is. Bidi = play or playing. NSO-I-BIDI (NSIBIDI) or NSO-I-BIRI(NSIBIRI) means what's playing? What's at play? Therefore, Nsibidi means what is playing or, what's at play? The language and words used in Nsibidi ceremonies are mostly if not all Ibibio words. Ikpo is Ibibio word for funeral. Ikpe is also Ibibio for judgment. Enyong or eniong is Ibibio word for North or upper strata. Ekpe is Ibibio word for leopard and Esop is Ibibio word for court. Nsibidi was later adopted as the name for the writings associated with Ekpe society. It is true that the Europeans found most of the Nsibidi script among the Ekoi, but it is really of Ibibio origin. When Aro and their allies conquered the Ibibio in 1634, they took over the oracle but retained its priests, with Loesin as the chief priest. It was he who later initiated Aro indigenes into the cult as priests. IBINI UKPABI is the IGBO corruption of IBIT UKPABI. Some say the Igbos used the word IBINI as homage to the slave-raiding Oba of Benin who caused their migration to Arochukwu. After the IBIBIO lost AROCHUKWU, the Igbos renamed the Ibibio deity IBI ITAM (Drum of the Crown). They called it IBIT UKPABI. IBIT is IBIBIO for DRUM. UKPABI is an IGBO name. The corrupted version, IBINI UKPABI, is what they use these days. Since Arochukwu(Mbot Abasi in Ibibio or God's creation/people in English) is the spititual center of the Igbo race, you can say that their 'holyland' is actually of Ibibio origin. I'll call it the IBIBIO CIVILIZATION OF AROCHUKWU. The Ibibio created it and that explains why the Aro deities have mostly Ibibionames. The Igbos could not fully adapt Nsibidi because translation from Ibibio into Igbo had too many constraints. Original meanings of Ekpe society's Nsibidi often got lost in translation. Agwu Inobia or Eze Agwu was one of the founding fathers of the city of Arochukwu, the third largest city in Abia State in southeastern Nigeria. He was the descendant of Nna Uru (a immigrant from the Igbo heartland to the Obong Okon Ita area) and king of the Eze Agwu clan centered in their capital the Amanagwu city-state. As new settlers, the Eze Agwu clan was resisted by the regional power Obong Okon Ita which led to the start of the Aro-Ibibio Wars. The war initially became a stalemate. Both sides arranged a marriage between the king of Obong Okon Ita and a women from the Eze Agwu clan in an attempt for a peaceful coexistence. The marriage eventually failed to bring peace but eventually played a decisive role in the war. "The other major slave-exporting state was a loose confederation under the leadership of the Aro, an Igbo clan of mixed Igbo and Ibibio origins, whose home was on the escarpment between the central Igbo districts and the Cross River. Beginning in the late seventeenth century, the Aro built a complex network of alliances and treaties with many of the Igbo clans. They served as arbiters in villages throughout Igboland, and their famous oracle at Arochukwu, located in a thickly wooded gorge, was widely regarded as a court of appeal for many kinds of disputes. By custom the Aro were sacrosanct, allowing them to travel anywhere with their goods without fear of attack. Alliances with certain Igbo clans who acted as mercenaries for the Aro guaranteed their safety. As oracle priests, they also received slaves in payment of fines or dedicated to the gods by their masters as scapegoats for their own transgressions. These slaves thereby became the property of the Aro priests, who were at liberty to sell them."